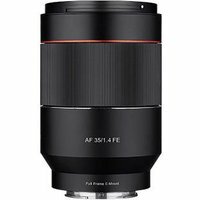 The Samyang 35mm f1.4 AF Lens is a wide-angle, autofocus prime designed for full-frame Sony E-mount cameras, such as the a7 and a9 series. Its bright f1.4 aperture is ideal for shooting high-quality images in practically any lighting situation and is suited for achieving selective focus imagery with beautiful bokeh. The AF system is quick and quiet thanks to the Linear Super Sonic Motor.